The four leaders are to discuss climate change and multilateral relations between Europe and China. Macron has been vocal about wanting to switch the EU's approach to China from a bilateral standpoint to an EU-wide strategy. "The face of a Europe that speaks with one voice on the international scene is emerging," the statement added. READ: China's Belt and Road plan: Why did Italy sign it and why is Brussels worried? 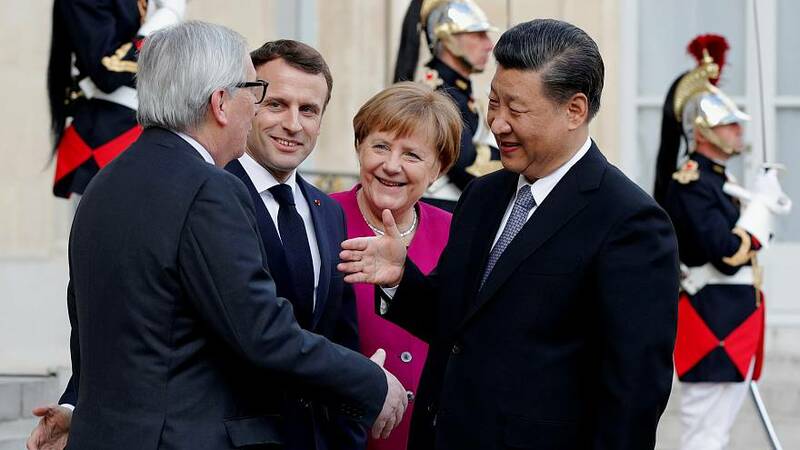 The meeting with the German chancellor and the European Commission president comes just a day after Macron and Xi announced a slew of deals between their respective countries totalling about €40 billion. China concluded a deal to buy 300 Airbus aircraft for a reported €30 billion while French energy company EDF signed a €1 billion-contract with the China Energy Investment Corporation to develop an offshore wind farm. Criticism about China's trade policy has increased since the election of US President Donald Trump. Western countries accuse China of creating an uneven playing field by forcing western companies to hand over technology to access the Chinese market while also making it difficult for foreign businesses to win public procurement contracts. China meanwhile has been championing its Belt and Road Initiative (BRI) — which aims to link the country to south-east and central Asia, the Middle East, Europe and Africa through an infrastructure network on the lines of the old Silk Road — and which has been described by some as "debt-trap diplomacy". Italy drew sharp criticism from Germany and EU officials last week when it became the first G7 nation to sign up to the BRI. "Countries that believe they can do clever business with the Chinese will wonder when they suddenly wake up in dependency," German Foreign Minister Heiko Maas told Welt Am Sonntag newspaper as cited by Deutsche Welle. But Xi sought to dismiss French criticism in a tribune published on Sunday in Le Figaro. "It's up to us to work with France to develop a global and strategic partnership that is more robust, stable and dynamic," Xi wrote. He added; "We want our development to benefit others and that's the case with the BRI."